Pasternack’s rapidly expanding in-stock waveguide portfolio is the largest in the industry and provides customers a comprehensive suite of waveguide solutions. Pasternack, a leading provider of RF, microwave and millimeter wave products, introduces a brand new family of precision waveguide twists operating from 18 to 110 GHz across seven frequency bands. Ideal for systems requiring a gradual turn in the polarization and waveform, these twists are designed and constructed to prevent unwanted distortion in the signal’s transmission. Pasternack’s new waveguide twists are useful components when building a waveguide system, as they allow the waveguide to be turned at a precise angle in order to meet the mechanical and electrical constraints of the overall system. These waveguide twists are also beneficial in applications to ensure correct polarization of the signal. Pasternack offers both 45° and 90° waveguide twists from stock, with the 45° versions being available in both right hand and left hand twist configurations. More than 20 unique models of waveguide twists are offered from Pasternack with waveguide sizes ranging from WR-42 (18 GHz) to WR-10 (110 GHz). 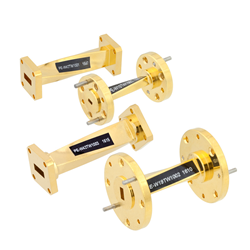 This portfolio of waveguide twists boasts gold plated brass construction that offers excellent electrical performance with VSWR as low as 1.02:1 and insertion loss as low as 0.2 dB. Both square and circular UG-style flange types are available and mechanical length ranges from 1 to 2.7 inches. All waveguide twists from Pasternack are in-stock and available to ship the same day. The new waveguide twists from Pasternack are in-stock and ready to ship now. For more detailed information, please visit http://www.pasternack.com/pages/RF-Microwave-and-Millimeter-Wave-Products/waveguide-twists.html. Pasternack can be contacted at +1-949-261-1920.